Comments: Dr. L.R. 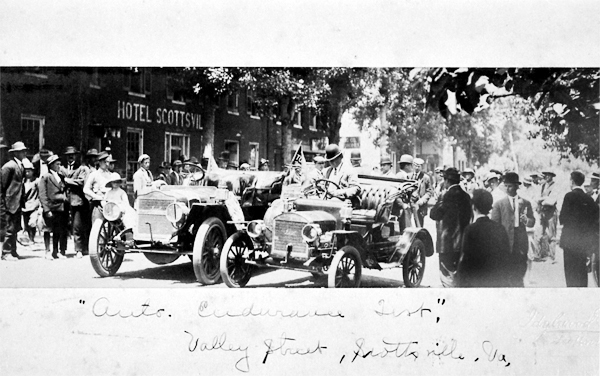 Stinson owned the first car in Scottsville, a two-cylinder, bright-red, 1910 Maxwell. Soon these 'motorized carriages' were rattling the plank floor on the new town bridge. 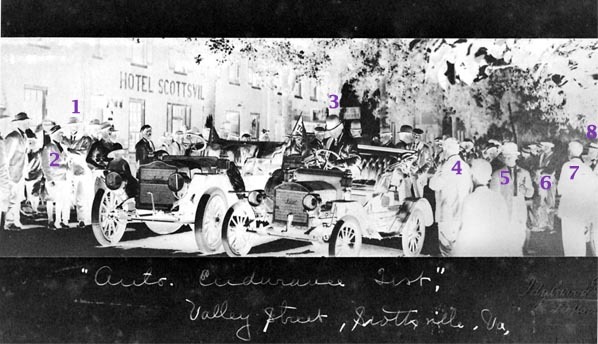 Cars altered Scottsville's way of life greatly, wiping out the ferry, carriages and carts, and the blacksmith shop and stable on the corner of Valley and Main Streets. (1) Jackson Beal, Mayor of Scottsville for 25 years and a prominent businessman who owned the Beal Building on Valley Street. He married Mary Emma Bledsoe of Fluvanna Co., Virginia, and lived at Old Hall on Harrison Street. (3) Dr. L.R. Stinson of Buckingham Co., Virginia, who graduated from UVA's Medical School and around the turn of the century and set up his practice in Scottsville. (5) David Pitts, President of the National Bank on Valley Street and a member of the Virginia General Assembly.